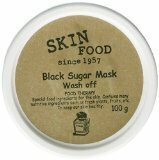 SKINFOOD Black Sugar Mask Wash Off contains black sugar ingredient, which contains rich minerals, vitamins and glycolic acid, for removing aged cuticles. It ensures better absorption of the following skin care products. Skin is revitalized and hydrated. Bright and tight skin is resulted. How to use: After cleansing, apply the mask to lightly wet face (avoid eye and lip area). Gently press and massage. Leave it for 10-15 minutes and then rinse well with water.